Organizations can gain value in their efforts to improve change competence by having senior managers individually assess what the organization does well and not so well, followed by a management team discussion of those assessments and the reasons for them. We believe that the best way to examine an organization’s level of change competence is to look at what we call Results‐Based criteria as well as Means‐Based criteria. The two lists of criteria below have proven to be very useful stimulators of conversation among managers interested in improving their organization’s level of change compete. This survey is designed to give you and your organization “food for thought” around the subject of organizational competence in change and change management. The first part of the assessment is focused on the “results” you would expect to see if your organization were highly competent in making change happen for good business reasons. 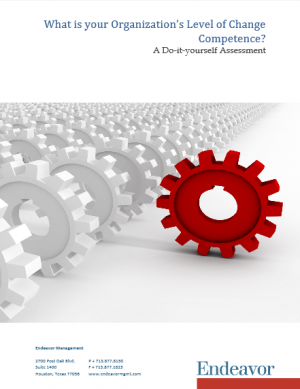 The second part of the assessment is focused on what are known to be the “means” of change competence. If these means were in place, your organization would have much of the necessary machinery for change competence.